Travel from Flagstaff to Grand Canyon National Park on a single day tour with 3 hours at the deepest and widest part of the canyon. Enjoy a full-day tour of the Grand Canyon’s South Rim with roundtrip transportation from Flagstaff in a deluxe tour coach, with a stop for photos in Historic Williams, Arizona, the last Route 66 town to be bypassed by the freeways. 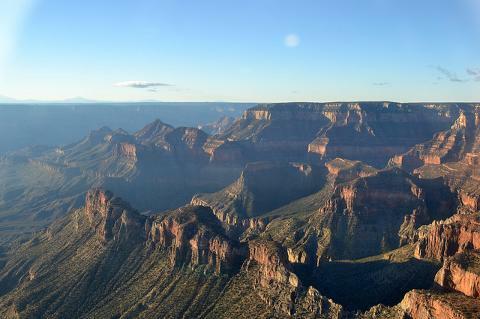 Once you arrive in Grand Canyon National Park, you’ll have 3 hours to explore the deepest and widest part of the canyon, the South Rim. 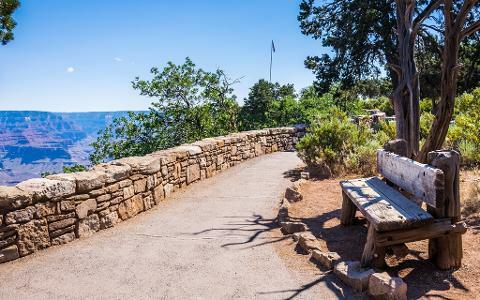 When you get off the bus, your driver will set up the picnic lunch (provided by the tour) which you can enjoy while taking in the views and learning about various things you can do to make the most of your time in the park. Options like a Historic Railway Trip, Bicycle Tour of the Rim and Helicopter Flight are options for today as well. 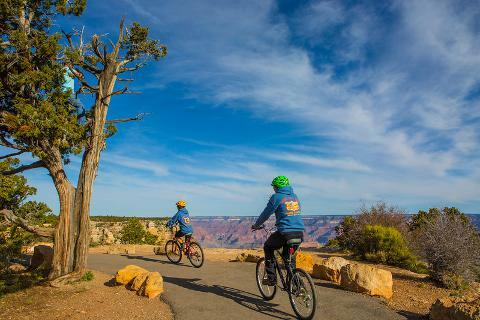 Popular attractions in the Grand Canyon National Park include El Tovar, Hopi House, Kolb Photo Studio, and the Bright Angel Trail – your guide will fill you in on all the details about what you can do and see. 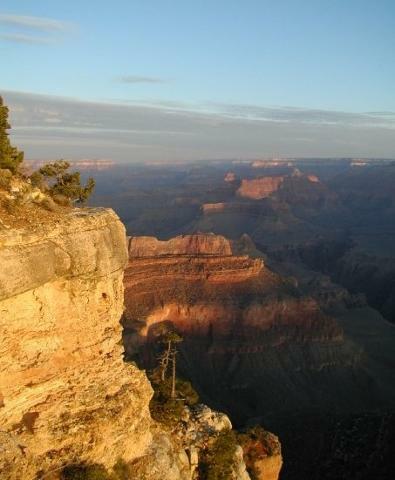 This tour is conducted with transfers in Williams on the way to and from Grand Canyon National Park from Flagstaff. Canyon. Guests will have approximately 2 hours in Grand Canyon National Park after arriving in Grand Canyon Village. 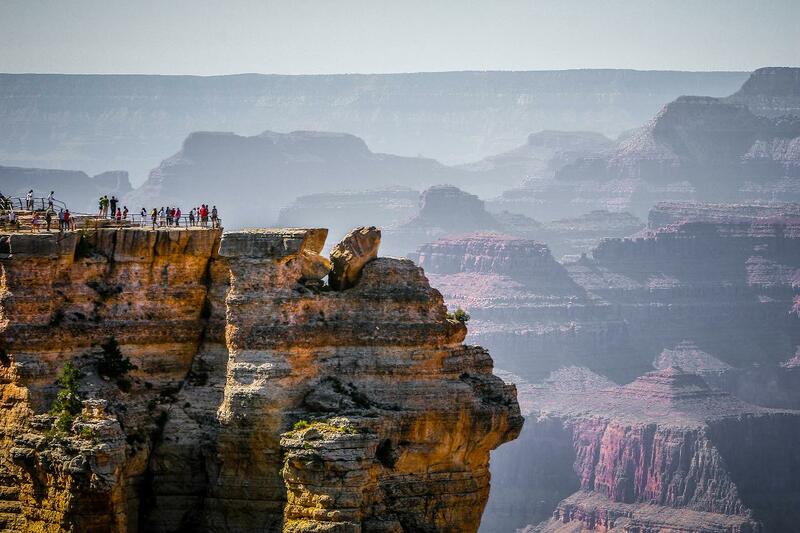 Guests fly over the deepest and widest part of Grand Canyon. Guests who choose this option as part of their 3 hours at Grand Canyon may not visit both points at the canyon rim. They will still have the remainder of their 3 hours of time in the park for lunch, rim walks and photos. 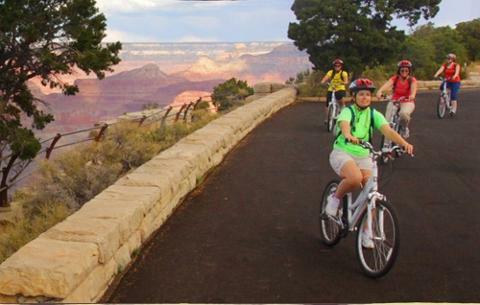 Guests will have a guided tour of the canyon rim, complete with bicycles and helmets. This tour is suitable for beginners or experienced riders, there are carriers for the kids! Your guide will lead you along mostly flat pathways that skirt the canyon rim, with stops for stories and photos. Picnic lunch Guests will be asked for their choice of Vegetarian or Turkey Sandwich at the time of booking. What To Know? FAQs What to Bring? -The tour coach is marked “CHD” -- Lunch – Guests will choose Vegetarian or Turkey sandwich. -Children 2 and Under – Lap children, who do not need their own seat, are free. 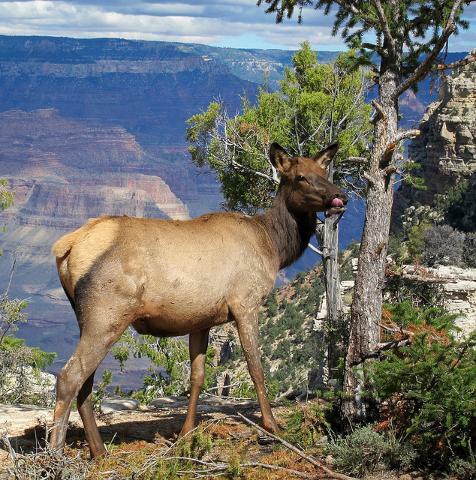 -Grand Canyon National Park Tour requires guests to be able to walk between attractions and the motor coach. There is little walking required or as much as guests like. -We recommend that guests bring comfortable shoes, sun hat, sunglasses and sunscreen. Also, drink water throughout the day. If you have an umbrella, you might like to use it on sunny days.